Archive photo of Gordon from the days when he still had hair and a waist. A warm welcome to Ganseys.com, a blog celebrating the traditional hand-knitted pullovers worn by the fishermen of the British Isles. Ganseys, or Guernseys (the two terms are interchangeable) are remarkable garments. They feel heavy when you pick them up but sit easily on the shoulders and are surprisingly comfortable to wear; knit very fine in a tough, fine wool they resemble a kind of satiny chainmail, tight enough to keep the wind out while the distinctive underarm gussets offer considerable freedom of movement. Each gansey is only ever knit in one colour, traditionally navy blue or cream, but nowadays in just about any colour imaginable. But the real attraction – the reason I have never graduated from ganseys to another style of knitting (Fair Isle, or Arran, for example, or anything other than pullovers, come to that!) – is the inexhaustible range of intricate patterns recorded from around the British Isles. The fine stitch gauge makes some truly stunning patterns possible, like a kind of monochrome Persian carpet. Quite simply, they are beautiful garments, and a lifetime is not enough to fully explore all the diversity of the collected patterns that exist from Cornwall, East Anglia, Yorkshire, Northumberland, round the north and east coasts of Scotland and the Islands – at least my lifetime isn’t going to be long enough! 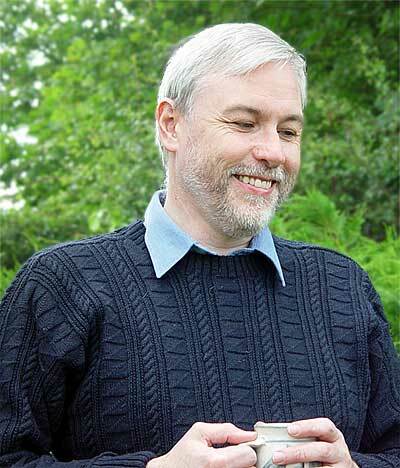 I’ve been knitting ganseys for over 25 years now – ever since Margaret my wife taught me to knit while I was “summering” on Cape Cod shortly after our wedding and I picked a gansey-style kit from the rack to start with, because I “liked the look of it”. I still do. Margaret and I live in Caithness, in the small town of Wick (just south of John O’Groats). I’m the Caithness Archivist by day, and write novels and short stories in the evenings – when I’m not knitting or trying to perfect sourdough baguettes. My novels—six in total now—are now available on Amazon for kindle. I created this blog to share my enthusiasm for gansey knitting, to offer a forum for discussion, and hopefully to encourage others to give ganseys a go – after all, if I can do it, anyone can! Still here, keeping a low profile! Next instalment will appear on Tuesday 2nd.